Escape the city for a thrilling hike to the top of Qixing Mountain, one of Taiwan’s highest peaks. 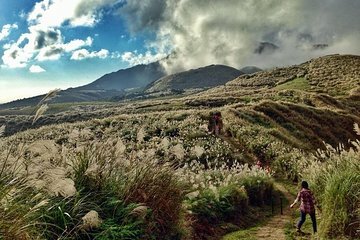 This full-day hike from Taipei scales both peaks, passes the Lengshuikeng mountain lake, and affords spectacular views of the ‘Seven Stars’ mountains. Make your own way to Jiantan MRT Station to meet your guide and small group of up to 15 people in time for a 9.30am departure. After a short bus ride, arrive in Yangmingshan National Park and enjoy your first view of Qixing Mountain, the ‘Seven Star Mountain’. Accompanied by your guide, set out on an exhilarating hike, climbing steep stairways, paved trails, and forested passages, and stopping along the way to spot wildlife and natural fumaroles. On arrival at the summit, pause to enjoy views of the ‘Seven Stars’, the seven surrounding mountain peaks, and perhaps see as far as Taipei and the ocean on a clear day. Re-fuel with a packed lunch (not provided), before setting off to scale the east peak, then winding back down, past the Lengshuikeng crater lake. After an unforgettable full-day hike, your tour ends back at Jiantan MRT Station. I had the pleasure to be guided by Victoria, who is a great companion on the hike. The leg/foot soak after the hike in the local hot spring was a real treat. Victoria also took time and led me to the local gear shop so I could purchase a new pair of hiking shoes. Nice trip with a personal touch!